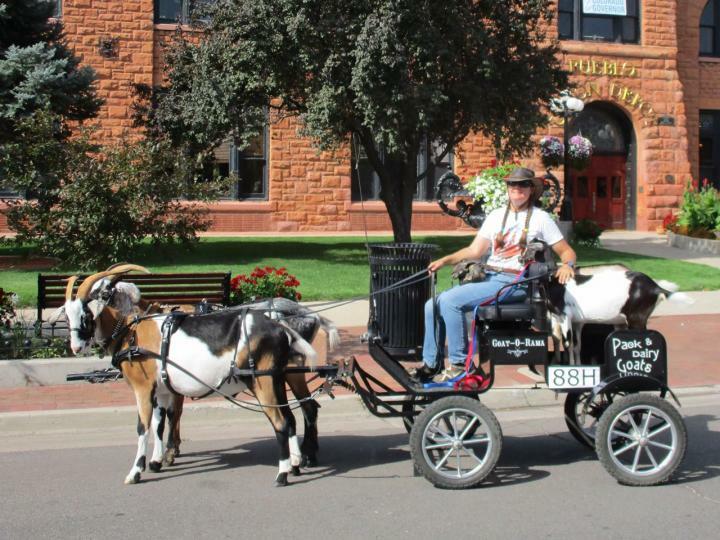 Phil and I drove our team and carriage in the Colorado State Fair parade this morning. 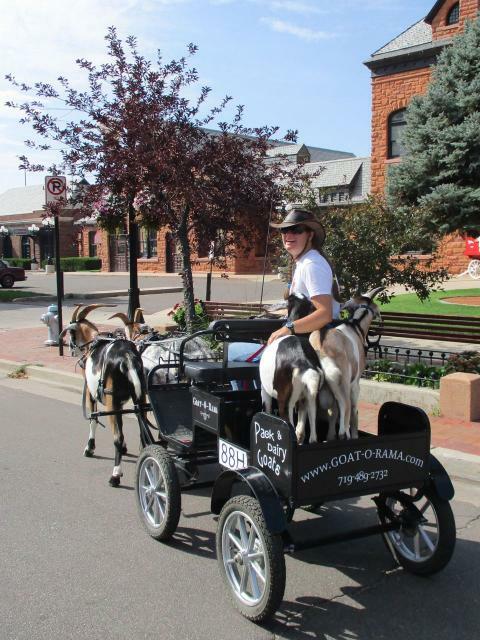 And just for a little added fun, we brought Max and Sadie with us as passengers and to help us advertise Goat-O-Rama. I had some custom car magnets made up so we could add them to our carriage. 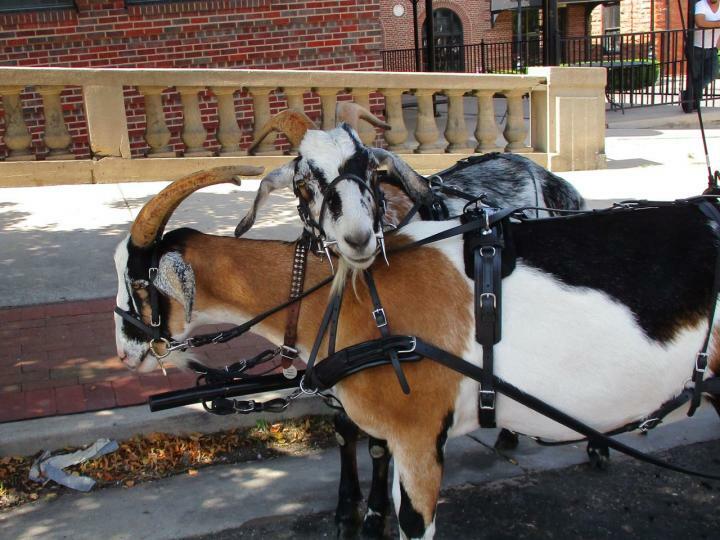 I figured this might be a good way to sell some goats. Sadie was awesome. This was her first time away from home and she never made a peep or got fractious. We had Max in the wagon bed with her at first, but he kept hogging all the space and pushing her off the side, so we removed Max and let Sadie ride by herself. We made Max walk on a leash beside the carriage during the parade and Sadie went straight to relaxing once he was gone. She laid right down and stayed there quite contentedly during the entire parade. It was funny to hear the kids squeal with delight when they spotted her laying down in the carriage. 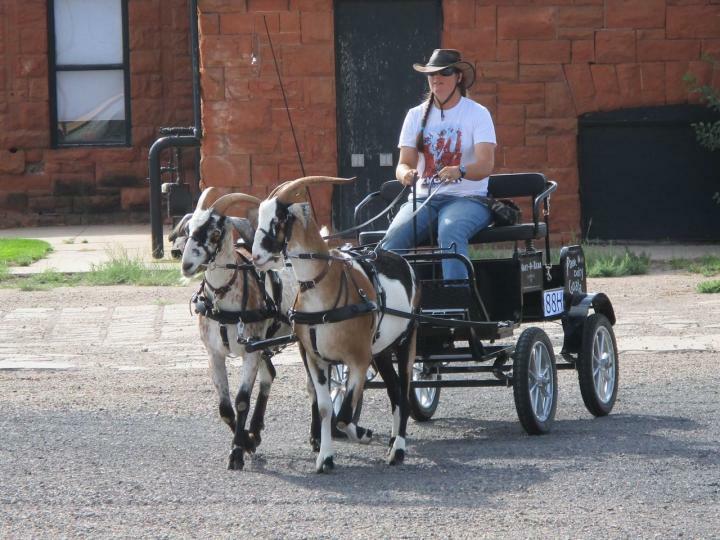 They'd squeal at the goat cart first, and then the volume would go up considerably when they spied Sadie. They'd jump up and down screaming, "Look! Look! There's a baby goat riding in the back!" We were entry #88, which meant we didn't really get started until after 11:00, but we had to be at our place in line by 9:30. This meant we had a long, tiring wait. It was fun for Phil and I because we enjoyed watching the parade go by in front of us (our lineup position was on an intersecting side road), but Finn and Sputnik weren't interested in the parade so they just had to be patient. Luckily we found a shady spot under a tree. The parade seemed to be largely made up of huge, noisy marching bands. Luckily the goats didn't mind the noise at all and weren't nervous. The only thing that upset the boys was when a young kid ran up and hit Finn in the face with a balloon during lineup. His mother grabbed the kid and scolded him pretty soundly and apologized to us. Finn and Sputnik spooked and jumped backwards, probably not so much out of fear but from surprise that someone would do something so rude. I don't think they'd ever seen a balloon up close before, and they're certainly not used to someone walking up and bopping them in the face! I'm glad the kid's mother took charge right away. Sadie was a picture of contented relaxation the entire time--first while we waited in line and then while we marched in the parade. But Max was something else altogether. He's not particularly rowdy or mischievous, but I've never seen a goat so "on the move". He has to be doing something all the time. And he's extremely enthusiastic about whatever it is he happens to be doing, so he's a wonderfully fun goat to be with. 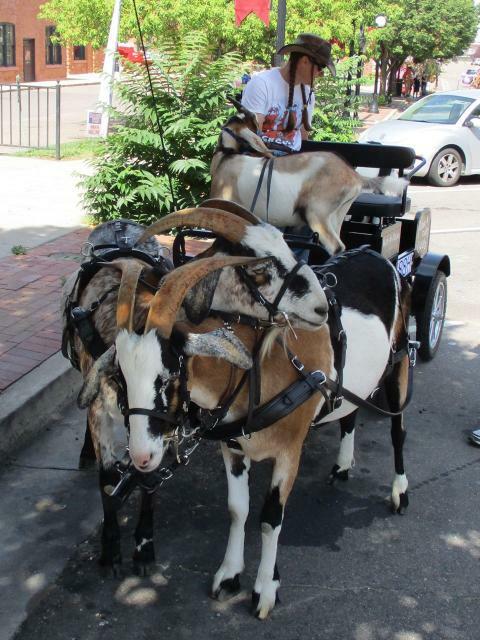 He ended up walking the parade route on a leash because he wouldn't share the wagon nicely with Sadie. Today was his first time wearing a halter, and he led very well in it. Phil didn't once have to get out of the carriage and encourage him on foot. Finn and Sputnik were eager to get back to the staging area after the parade and head home. They were wonderfully good during the parade, but it was a long, long wait before we started and the weather was hot and humid. They earned their break today! And I'm really proud of Max and Sadie. They were little troopers. Awesome. You all are a beautiful team together. Max just needs a job, I'll bet he'll be a great working goat within few years. Thanks you! And yes, Max will love being a packgoat. He seems to love everything as long as it's with people. 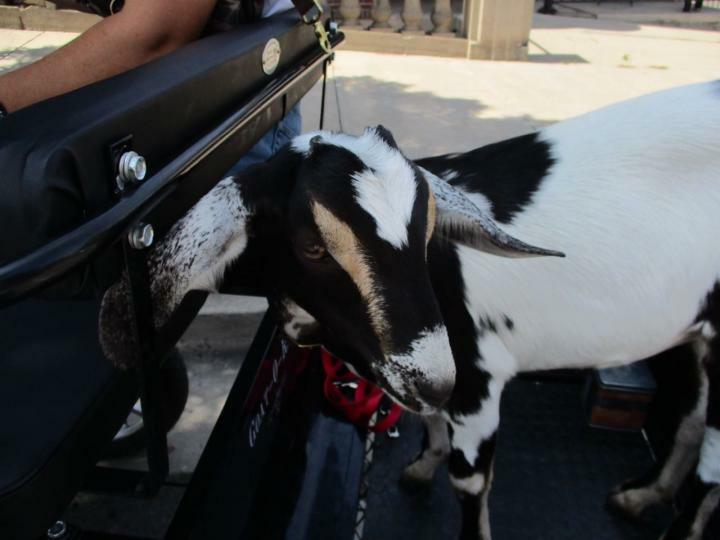 I can't see this goat ever being a complainer, and he seems gung-ho for any new adventure. He's a very quick learner to boot. I can't wait to see how he turns out in a few years. While goats pulling a cart may seem exotic, if you want to continue to be an innovation leader, it may be time to move on to the next level: Tapirs. But I don't really like tapirs (although they do make funny noises). Giraffes are way cooler. I've always wanted to ride a giraffe. Saw these pics on Facebook - fantastic!